Our goal in creating this site was to empower women to embrace natural childbirth, to help women worldwide understand their body's innate ability to birth a child, and most of all, to help women achieve the natural birth experience they desired and deserved. YOU can be a powerful force in paying forward the true message of natural childbirth. There are many ways you can help. Choose one or choose them all!! 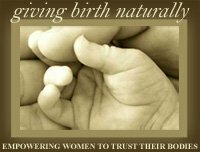 <a href="https://www.givingbirthnaturally.com">Giving Birth Naturally: Empowering Women to Trust Their Bodies</a> A guide for each woman giving birth naturally with evidence-based natural childbirth articles, online childbirth classes and childbirth video galleries. If you value the content of this website, pay it forward by sending friends a link to this site. If you do choose to leave a donation, we'd like to thank you by sending you a free relaxation script. No matter what method you choose, every little bit helps! We truly appreciate your help in promoting natural childbirth!